Everyone knows the OHL is the best junior hockey league on the planet – that’s just a fact – and as such there are far too many players from Ontario in the Top Prospects game for just one post. Earlier I took a look at the players that will be competing for Team Orr Monday night – now here are the rest. Owen Tippett scores – it’s just what he does. The 17-year old winger has 36 goals in only 45 games this season, which is good enough for second in the OHL behind only Alex DeBrincat. Just yesterday I was talking to someone who said Tippett reminded him of Jeff Skinner when he was playing in Kitchener. This is a very good comparison. Tippett is Jeff Skinner – if Jeff Skinner were four inches taller and was a right handed shot. That’s a scary thought. I think Tippett is the best OHLer in this year’s draft and I have a more in-depth scouting report on him from earlier in the season here. The Owen Sound Attack have been a huge surprise this season and the main reasons for that are goalie Michael McNiven and breakout star Nick Suzuki. The 17-year old centerman scored 20 goals in his rookie season after being taken 14th overall in the OHL draft. Despite this, he was still being overlooked by many going into the season – probably because he plays in Owen Sound. Suzuki is an incredibly gifted offensive player and a guy who was looking like he’d be a sleeper pick when I wrote a scouting report about him earlier this season (here). He’s waking people up one game at a time and is going to look to open a few more eyes against the other top prospects. Gabe Vilardi is being looked as by many as the top OHLer in this summer’s draft. He is big, younger than most in the draft class, and immensely talented. Vilardi has been working through injuries that have cut down on his game action this season, but when he’s in the lineup he’s shown why many expect him to be a top-5 pick in the draft. He’s very smart player that knows when to create a scoring chance for himself and when to be a playmaker for his linemates. Vilardi already knows how to use his big frame to shelter the puck, and as he grows up (he won’t be 18 until two months after the draft), his strength on the puck will turn from great to elite. He’ll never be accused of being one of the better skaters in the league – he’s not overly fast and his stride is pretty ugly, but it’s not something that should hold him back. The potential is there to have a long, fluid stride – if a skating coach can work a few kinks out. He looks like a very high-end #2 center at the NHL level right now, but it his skating improves, he’s got the talent to be a top-line offensive player down the road. Lodnia is the latest in the line of high powered offensive forwards to put on an Erie Otters jersey. One of the most talented players in his OHL draft class, Lodnia probably would have gone a lot higher than 20th overall if he had not been flirting with NCAA schools. He does his best work with the puck on his stick. He’s creative in a way that you only see from a handful of players and in a way that helps to overcome his lack of strength. He has great stickhandling and one of the most accurate passes you’ll see. He doesn’t necessarily have elite speed but he is incredibly quick and agile, especially when moving laterally – kind of like Mitch Marner. The biggest knock on Lodnia is his play without the puck. He’s been accused of giving up defensively and being unable to sustain his intensity through the whole shift. Consistency and drive to succeed will be key to his development. With 20 goals and 44 points through 45 games this season, Lodnia isn’t exactly filling up the score sheets – but with Strome, Raddysh and Debrincat moving on at the end of the season, we will likely see Lodnia demolish his career highs when given an expanded role. If he were to contend for an OHL scoring title one day, I wouldn’t be at all surprised. His game can be so smooth – sorry I couldn’t help myself. The London Knights aren’t a team that usually gives much playing time to young players, so the fact that Thomas played 40 games as a rookie last season is a big accomplishment. This year, Thomas has moved up into the middle-6 in London and is proving that he has the talent to be a key piece on a winning team. He has 42 points in 45 games and has shown the ability to move up and down in the lineup whenever needed to. He works the middle of the ice well, using speed and strong puck-handling skills to create space for himself. He’s a playmaker first and is always looking to put his linemates in a position to succeed. As the season has gone on, Thomas has started to move towards the late first round. A strong prospects game and a run towards the Memorial Cup could push him over the top. When you’re this big (6’5, 200lbs) and you can skate as well as Isaac Ratcliffe can, you’re going to get the attention of NHL scouts. He’s very skilled for a guy his size and when he decides to use his physical gifts to his advantage, there’s no stopping him – the problem is that he doesn’t always use his size the way you’d expect. He needs to get a lot more consistent when it comes to being aggressive and utilizing his size advantage. If he ever can, he’ll have the ability to be a high-end power forward in the NHL. Ratcliffe has a very good top-speed and likes to go to the net hard with the puck. He’s got great hands down low and in front of the net – not unlike what we see from James van Riemsdyk. He has 22 goals playing for a young – but still bad – team in Guelph. Ratcliffe is finding his way into a number of top-31 rankings, and his blend of raw size and speed would make the ideal pick for a team drafting in the late first round that has the ability to be patient with him as a prospect. Adam Ruzicka is a guy who has seen his stock drop significantly this season. He’s struggled to find consistency as a rookie in the OHL – something that should be expected for a young kid playing his first season in North America. Ruzicka is 6’4 but doesn’t play like it. 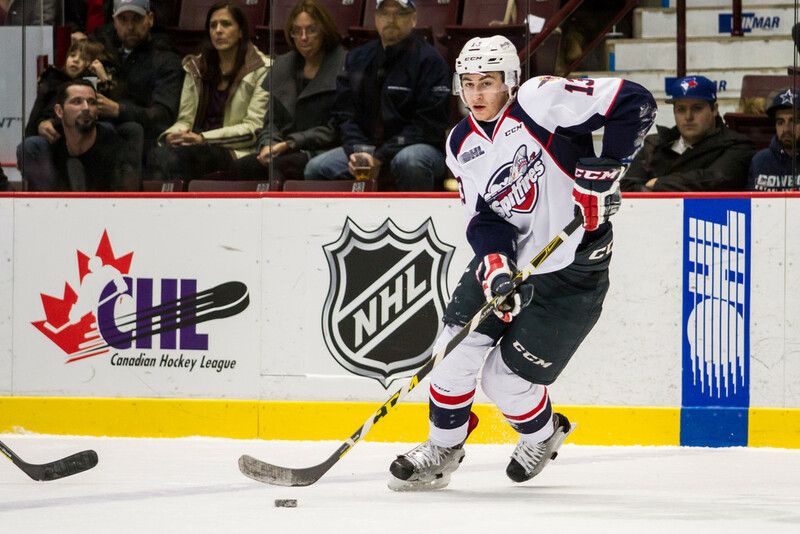 He is a magician with the puck – some of the best puck handling skills in the OHL. He’s got the raw ability that scouts drool over, he just hasn’t come close to showing them on a regular basis. He’s a boom or bust prospect. A team will draft him thinking they’re the ones that can harness the potential and turn him into a star. After a poor showing at the World Juniors, Ruzicka will be looking at the Top Prospects game as a chance to re-establish himself as a potential first round pick. Another very big kid, Mackenzie Entwistle stands 6-3 and has a frame that can easily mature into that of a big power forward at the pro level. Entwistle plays a very solid all-around game and while he may not stand out, he does just about everything well. He’s a good skater and strong kid that contributes more to create chances than the score sheet might indicate. He is a very good forechecker that isn’t afraid to use his size. He plays with a physical edge in order to win battles down low and against the boards. Though he only had 14 points as a rookie last season, Entwistle had a very strong end to his rookie campaign and followed it up with a very good performance at the Ivan Hlinka tournament – playing a 4th line role for Canada. Entwistle is a guy who will be drafted in the middle rounds with the knowledge that he will play two more seasons of junior before we really know what potential he will have as a pro player. In all likelihood, he’ll be projected as a bottom-6 power forward and be developed as such.